Water channel on the left side of Jalan Letjen Suprapto-Jalan Kodam Raya RT 03/06, Sumur Batu, Kemayoran, Central Jakarta is repaired.
" We need to install U-ditch and cover the channel with concrete"
This channel is repaired since it becomes silting and narrowing. 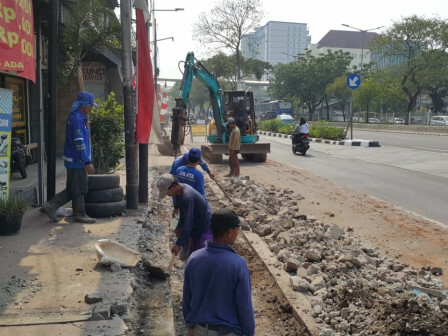 "We need to install U-ditch and cover the channel with concrete thus it can hold the road-load and water volume," mentioned Fajar, Central Jakarta Water Resources (SDA) Sub-dept. 's Development Section Head, Tuesday (9/11). He deploys 10 personnel and mini excavator unit to demolish former channel's concrete covers and reconstructed the channel. His side plans to reconstruct the channel with length 232 meters, height 1 meter, and width 1 meter. "After repaired, water will flow to Cempaka Mas PHB channel. This project is targeted to finish in November," he explained.